Look what just came in to IBB for one of my clients! I’m a huge fan of adding small benches & ottomans to a room. 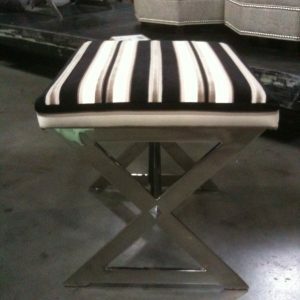 They give you additional seating & can also be a fun way to add some style through great fabrics. Today’s sneak peek is from a project I am working on in California. The home belongs to a young hip single man who requested the home be done in layers of neutrals. We’re primarily using taupes, blacks, shades of white & gray. The X bench by Century. I’m using two of these on either side of a fireplace in the formal living room with some very cool art above each one. The chrome base will add a sleek look to the room. The cushions are made out of a rich velvet stripe by Barclay Butera for Kravet. I am a HUGE fan of Barclay’s fabrics! I’m using several of them for this project. 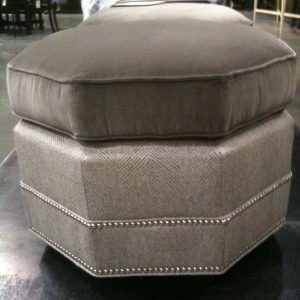 This is one of my all time favorite ottomans. It’s by Hickory Chair. I’m using two of these at the foot of the bed in the master bedroom. The cushions are out of a soft supple gray velvet. The bottom fabric is out of a small herringbone print in gray & white. I added chrome nail heads to highlight the beautiful shape of the ottomans. I’ll be installing the home in a few months, so stay tuned to see a few of the finished shots of the home!